"Dying is not for the faint of heart . . . . . . Neither is the murder of a mysterious philanthropist with ties to the Russian mob and 1939 gangsters. At an A-list charity ball organized by his wife, Angela, former detective Oliver "Tuck" Tucker is doing his best to prove that ghosts know how to have a good time--until a man is murdered in cold blood on the dance floor. Never one to let a mystery go unsolved, Tuck is on the case with help from Angela and his former police-detective partners. Together, they must be the first to read "the book"--deceased gangster Vincent Calabrese's journal that names names and reveals the dirty secrets of several modern-day spies. Dying for the Past is the second book in the Gumshoe Ghost Mystery series. I really enjoyed the overall mystery and it’s concept. The book begins with a film noir, New York ‘30s P.I. vibe, and the tone had me hooked. Although the noir voice faded throughout the book, the tone remained and it kept me interested in the characters and their role in this elaborate mystery of gangsters, family vengeance and hidden treasures. 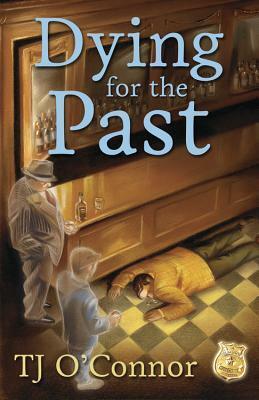 Among the hard-boiled mystery, Dying for the Past contains politics, governmental shenanigans, paranormal intrigue and historical nuances. Now, although I’m not really into the political genre of books, the other aspects made up for it and created a unique reading experience. One thing I didn’t understand about the book were the changing point of views. I think the changing from 1st person to 3rd person between chapters could've been effective if a break (such as “meanwhile…” and etc.) was put in place, so that way our minds have a better transition from Tuck talking and overseeing to the general 3rd person observations. Besides this, I found the book to be a great read and wouldn’t mind reading more from the author. It should be noted that I went through the entire book frustrated from the allusions to the earlier mystery that took Tuck’s life because I felt out of the loop. It wasn’t until after I finished the book and read the “About the Author” section that I learned a previous book, Dying to Know, was written and this was indeed the second book in the series. It was listed as the only book in this series on goodreads and the publisher’s summary, so I went into it thinking it was book one. Once I found out about the first book, I put those frustrations aside, although I do wish I had read the previous book first. In all, I found the book very exciting, and loved how it kept my interest with the promise of suspense and mysteries of both the paranormal and historical. If you like a good hard-boiled mystery, with the essence of ghosts, a sprinkle of history and a dash of espionage, this book is absolutely for you!